Comments: Growing up in St. Helena in the early 1970's, our family owned and farmed 75 acres of old-head pruned vines. Most of this acreage was petite Sirah, or "Pets" as we affectionately called them. They were sold to the local co-operative winery, which used to ferment them in huge concrete open-top tanks. By the mind 1980s, all of these old vines had been replaced with more profitable varieties; like Cabernet Sauvignon, Merlot, and Chardonnay. By the early 1990s, the co-op and its concrete tanks were gone, as well. Luckily we began to sell Merlot to a winery, who not only produced a Petite Sirah, but who also had made their reputation with it. When it was time to replace one of our vineyard blocks, I approached the winery to see if I could grow Petite Sirah for it. So, in 1999 I had begun to develop a 10-acre block for the winery. This was also the year that I began producing wine under our own family name. For the first five vintages I only produced a Stanton Vineyards Cabernet Sauvignon. 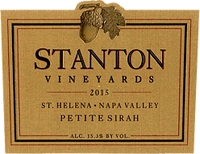 Beginning in 2004, I also began to produce a Stanton Vineyard Petite Sirah. I remain committed to this noble variety;and will happily continue to grow and produce wine from this, my favorite grape under the Stanton Vineyards label."